Welcome! First of all, any opinions and statements expressed on this website are mine and mine alone. They are not the views of the United States Antarctic Program, the United States Arctic Program, the National Science Foundation, ASC, Polar Field Services, or the United States Government. All photos are taken by myself unless otherwise cited. A little about me: I decided I was going to go to Antarctica after reading Shackleton’s Endurance in 6th grade. Through high school and college I kept this goal in mind. An interest in geology and climate change only brought me closer and I completed a degree in Geology focusing on snow, ice, glaciology, and climate change as much as possible. Since 2007 I have spent two summers working on the Juneau Ice Field in SE Alaska, five austral summers in Antarctica, one winter at the South Pole Station, and three and a half summers, two falls, and two winters at Summit Station in the heart of the Greenland ice sheet. I have worked in positions ranging from General Assistant shoveling snow to Heavy Equipment Operator running bulldozers, from Science Technician repairing scientific instruments to Station Manager overseeing station operations. While thousands of people have traveled to and worked on the continent of Antarctica and the island of Greenland most people I talk to have no clue people even visit these cold and remote places let alone conduct research on the ground. 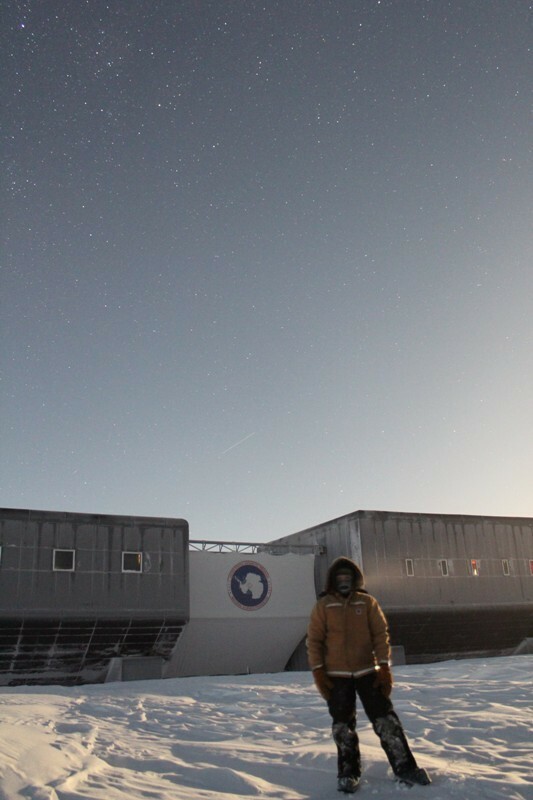 This blog is a way to share my observations and experiences and to hopefully try to answer some questions about living/working/conducting research in the Antarctic and Arctic. Leave a comment below if you have any questions, post ideas, or want photos of something in particular. Thanks for stopping by! Thanks for the comments! Scott is still a hero in many people’s eyes, he was just following the mindset and way of doing things of fellow British explorers of the time. Happy holidays to you as well! Love the blog! I’ve been trying to find someone with a sense of humour at the South Pole to help with a fun global science experiment about the Earth’s Gravity. Someone who’s willing to weigh our Travelling Garden Gnome and take a couple of quick photos. We’ll ship you everything you need. Could I possibly ask your help with this? Hi Marie this is Carol Ulrich, as in widow of Carl Ulrich, your grandpa’s brother. Hans is my grandson and he said he spoke with you when he was there doing research! Small world! I find your writings fascinating, and I want to keep up on them whenever you write. I have so enjoyed your journey over the last 9 months. I eagerly check my email every day to see if you’ve written again. I will miss your wonderful words, your wit and wisdom. May you have a joyous reunion with the world of green. Hi Marie. I’m a reporter with the Wall Street Journal working on a story about life at the South Pole. I’d love to talk to you. Feel free to be in touch via email — I’m at rachel.feintzeig@wsj.com. Thanks! I really like your sastrugi image! Do you think I could use it as a background for my website? Hey Aunt Marie! I jsut remembered that you had a blog, and I then found it! Love ya–hope to see you soon! Hi Marie,chi have been enjoying your blog ever since I ran into your dad at the B’ham theater gild a couple of years ago. I truly enjoy each entry and look forward to it every month. I’ve passed along the blog to a few friends and it has become part of my continued go educational experience. Thanks so much for keeping me informed. Keep up the adventure. Thank you Mr. Salisbury! Let me know if there’s anything in particular that piques your interest – always looking for more things to write about! Enjoying your blog over and over!!! There’s such an astonishing variety of info and pics …. just wonderful!!! To convert the dead links, you have to change “mintaka” to “aty”, AND remove the string “GF/” from the old URLs. A few years ago you generously gave me permission to use one of your photographs, ‘Spoolhenge’, in my book ‘South Pole: Nature and Culture.” I am now hoping you might grant me permission to use the same image in another publication, an academic article in ‘The Polar Journal’. The contact email I have for you no longer works so I was hoping you might reply to me through this comments page or send me an email. What kind of clothes did you wear in Antarctica? Hello – I’ve touched on this a few times, but here is a post where I went into more detail about what we wear: https://antarcticarctic.wordpress.com/2012/10/14/christchurchcheechchcchchnew-zealand/ Generally I wear wool long underwear, insulated carhartt bibs, maybe a light sweater or sweatshirt, and a carhartt jacket or windbreaker. On my feet I wear liner socks, thick wool socks, and big boots. Hands are covered by thick, insulated, leather gloves, and on my head I wear a fleece neck gaiter and a fleece lined wool hat and sunglasses if it’s summer. i am going to stay at the Pole for a year so can you talk a bit more about those months winter days when the sun completely disappears.What was the lowest temperature that you experienced with the windchill?And what kind of layers did you wear to be able to stay warm during those coldest and windiest days when you went out for long periods?Especially can you give me some information about your lower layers,socks and boots? And if you have can you send me some images and videos about your clothing? If you want you can send me e-mail it might be easier to communicate. Are you going to work at the Amundsen-Scott South Pole Station? What position will you have? On the right hand side of my blog you’ll see old posts broken down into months and dates, check out Feb-Oct 2013 to read more about winter. I’ve written a lot about that. The lowest temperature we experienced was -107.4F, and I don’t even know what the windchill was…we don’t really care about that at the Pole. You’ll be issued boots, but I would bring wool long underwear (doesn’t have to be SUPER thick) and plenty of wool socks. Also sandals or crocks or something to wear inside the station.